Holy Trinity, part of the Park? Holy Trinity Church was built in 1845-46, at the expense, (£3,600), of Thomas Carrill Worsley of Platt Hall. 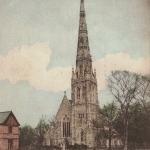 The Church was opened on Friday 3rd July 1846 by the Bishop of Chester. The new incumbent was the Rev. J. Currie. 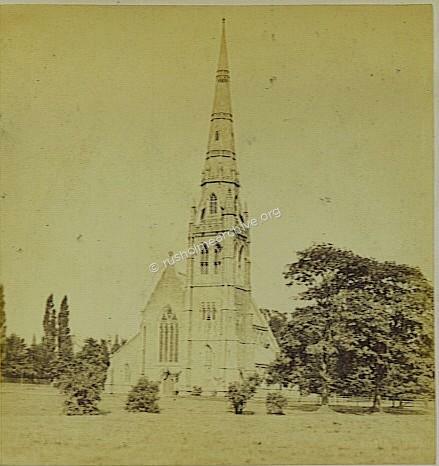 The other major landowner in the district, the Anson family that owned the Birch estate, were also paying for the construction of St James Church at Birch-in-Rusholme, perhaps there was some rivalry between the landed families, both churches opening in 1846. As Holy Trinity was built almost adjoining Platt Hall, (conveniently for the Worsley family to walk to), so it is often seen in views of Platt Fields. The architect, Edmund Sharpe, used terracotta tiling for both the exterior and interior, a comparatively new use for this product. It did resemble stone, but some critics objected to the imitation 'stone'. The tall and graceful spire was also faced in terracotta, but this has been made by a different supplier and proved to be of poor quality, necessitating the spire to be re-built in 1912. Click here for further reading about Edmund Sharpe. In 1946 the incumbent of Holy Trinity, the Rev Tom Darlington, wrote a small booklet as part of the Centenary celebration, the church having been opened in 1846. I have scanned this booklet and you can download the PDF file and read it provided you have Adobe reader installed on your computer. Whilst this booklet is still subject to copyright I am hoping that Holy Trinity PCC, (as the probable guardians of the copyright), will not object. 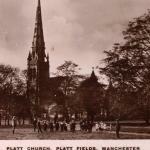 In 1971 to celebrate the 125th anniversary another booklet was published entitled 'The Family at Platt'. The first few page give a detailed history of the church and I have copied this below with the permission of the PCC). The east window in the church is a memorial to a man described as its founder: Thomas Carrill Worsley, who was born on 2nd November, 1792, and died on 3rd August, 1848, just two years after the building was officially opened and before its spire was finished. It is a fair description, since he conceived the idea, appointed the architect, was the driving force behind the construction, and paid for the entire project out of his own pocket, to the extent of about £5,000. The Worsley family had been the owners of the Platt estate since 1623 when Ralph Worsley bought it from the Platt family; the name Platt had been associated with the area since the twelfth century. The old Platt Hall was rebuilt in 1764, and the little Presbyterian Platt Chapel, which had become the family chapel of the Worsley’s, was rebuilt in 1 /90. But during the early years of the nineteenth century the chapel gradually became Unitarian, and round about 1830 the Worsley family ceased to worship there. Thomas Worsley was Christian of Evangelical sympathy. Although not very much is known about him as a person there is in the City Library the diary of one William Bembridge, who was employed by him as a door to door missionary to the poor of Newton Heath and the surrounding area, and this shows clearly that he was a man of true Christian compassion with a deep concern for the spiritual and practical needs of the poor. So he was undoubtedly conscious of the need for a place of Christian worship to replace Platt Chapel. In addition, the population of the area was beginning to expand. But it was not until 1844 that the idea for a new church began to take shape and it was not only Christian zeal which was then the spur to action. In April 1844 the patron of Birch Chapel, Mr. Anson of Birch Hall, announced that a new church was to be built to replace the chapel because it was too small for the influx of population. A building fund was started, and in July the architect was appointed. On the other side of Wilmslow Road, Thomas Worsley saw what was going on, and he decided that he must not only build a church himself, but that it should be a finer one than at Birch and that it should be finished first. “I have quite come to the conclusion that fireclay will, in this case, be the cheaper and better method. (That is, terra cotta would be more suitable than stone.) I am also quite decided that if the new church is to enter in comparison with the new Birch Chapel, a division of the roof of the Church into nave and side aisles, by means of columns and arches, is absolutely indispensable and that the adoption of any other form will place us so greatly at a disadvantage, that I had rather yield the privilege of designing the new church than allow the popular verdict to go against me, as 1 think it would”. Terra cotta is made from the same materials as ordinary pottery. It has been used as a building material since Roman times, but has never been in common supply, and there are only three churches built of it in this country, at Lever Bridge, Platt and Lancaster. All these were designed by Sharpe, but the original idea of building a church in terra cotta was not his but that of John Fletcher, a colliery owner in Bolton. As the coal was brought to the surface other materials came up as well, including fireclay, and so Fletcher set up a pottery works (the site of which may still be seen) as a side-line. He asked Sharpe to design a church to be built at Lever Bridge and supplied the terra cotta himself. But there were difficulties. The main trouble was that the pieces were too large. Consequently they were difficult to heat evenly in the kilns, and even when they did not crack at this stage, they began to do so soon after they were built into place. So the church at Lever Bridge is now in very poor condition, and its tower and spire have had to be taken down because they were unsafe. But Sharpe learnt by his mistakes, and at Platt the size of the mouldings was reduced: none is more than five inches thick, and larger pieces made hollow and then filled with concrete. Apart from the spire, of which more later, the terra cotta at Platt Church has survived its first 125 years quite well. “I think from the movements of the other party that no time is to be lost, and our Clerk of the Works should be appointed immediately, and an order given to Mr. Fletcher, who can prepare material for some time before we show it on the ground, by which means a start will be gained”. At the beginning of March 1845, the Clerk of Works started at the site. This was a key appointment, and it is clear that the successful completion of the job was mainly due to him - his name was Edward Harrison. He supervised the entire construction, bought many of the materials, kept the accounts, paid the workmen (4/6d. a day for skilled men), sorted out labour troubles and made regular reports to Worsley and to Sharpe about the progress of the work. When he took over, work on the new Birch Chapel was well under way. But Platt had three advantages: terra cotta could be produced more quickly than stone could be carved; there were no delays while money was raised, because Worsley paid all the accounts out of his own pocket; and finally, decisions could be taken on the spot, rather than waiting for a committee to meet. “Parts of the mullions are out of perpendicular and the window sills undulate in a very unsatisfactory manner. Indeed the whole building, though not deficient in ornament, will not bear a near approach. The structure may please the traveller from his post-chaise, but will not satisfy men of education and refinement of taste”. It is not known who wrote this. But whoever he was, he also found something to praise: the arch between the tower and the body of the church, which was later blocked up and was only revealed again to full effect when the new entrance was built in 1970. By March 1846 the completion was in sight. But time was short, and delays still occurred. We have cause to be grateful for one of them. That plans allowed for no divisions in the centre block of pews, or benches as they were then, and Worsley's sister Elizabeth proposed that the centre aisle should be clear. Sharpe was away when the letter arrived, but his assistant wrote back saying (at some length) that an alteration at that late stage was impossible. But Elizabeth was evidently a woman of determination, for she got her way, and so the centre aisle is clear from the west door to the chancel. Over at Birch the pressure was also on. A note in the minutes of the Building Committee on March 24th 1846 records that a letter was sent to the architect urging completion which they “do most anxiously desire for various pressing reasons which cannot be mentioned here”. The consecration dates were fixed for June 26th for Platt, July 1st for Birch, just five days later. How much work was done behind the scenes for Platt to get the earlier date, history does not record. At the beginning of May, the roof was completed but there was still much work to be done inside, on the pews, tiling, the lighting and heating. The spire was not even started and on May 11th Sharpe wrote to Worsley about the costing of it. Worsley, impatient as usual, wrote back: “The spire must on no account interfere with the consecration or opening of the church we intend to have it opened if possible on Trinity Sunday. I look upon the consecration and opening as more important than 100 spires”. Trinity Sunday was June 7th, almost three weeks before the Consecration. But since Worsley had chosen the name Trinity Church, in contrast to the Unitarian standpoint of Platt Chapel, it was a particularly important festival. (The name changed gradually to Holy Trinity: the first use of this name was in 1846 but the old one was still in occasional use up to 1880). But time was too short, and on the day of the consecration the inside was not complete. So even though the race with Birch was won by a small margin, the moral victory clearly goes to Birch, whose new church was fully complete by consecration day. There exists only one brief account of the consecration, which was carried out by the Bishop of Chester, the Rt. Revd. John Bird Sumner. From this it is clear that the ministry in the church was to be evangelical right from the start. Delays on the spire continued. Now that the pressure on time was less, Worsley began to be more fussy about costs, and about the middle of 1847 Fletcher stopped supplying terra cotta after a failure to agree about the price. The work was taken over by a man named Willcock, and it was not until almost five years after the consecration that the spire was completed. According to the architect, the design of the church was modelled on the typical 14th century Lincolnshire style. He seems to have borrowed ideas from a number of such churches - for example the tower and spire are very similar to those of All Saints’, Moulton, a church built in 1830 which Sharpe much admired. There seems to be no foundation for suggestions that either Salisbury or St. Michael’s Coventry were used as models. The detailed accounts up to 1847 for the building of the church still exist and show that the cost excluding the spire was about £3,600. Allowing for the spire, the total cost was probably just under £5,000. Worsley also provided an endowment of £1,200. The interior of the church has been much changed since 1846. But the communion table is the one originally used: It bears the date 1640, and almost certainly came originally from Platt Hall, which had been licenced as a place of worship for dissenters in the years which followed the Acts of Uniformity. The pews are also original, though they were probably without backs at first: an interesting point about them is the terra cotta mouldings in the ends, which are painted to look like wood. The roof of the chancel was lower: this was without much doubt a serious design fault, which was put right in 1906. The font is original, but was at first in the porch. Lighting was by paraffin lamps, replaced by gas in 1854. There was a heating system of some kind, but clearly it was inefficient, and it was replaced in 1855. Doubtless this was the reason why the tower arch was blocked up, probably in 1850. There was no organ at first, but in 1849 a small one was installed near the west door. The drains were blocked and had been sending the rain water from the roof straight under the floor causing damp walls and decay. The whole floor was replaced and (more important still) the ground sealed with tar and the drainage put right. The work was done very thoroughly, and now almost 80 years later, the under floor area of the church is still sealed and dry. Also in 1891, the present choir stalls were put in, the windows were re-glazed, the terra cotta parapets were repaired and dry rot in the roof (caused by leaky gutters) was put right. Fifteen years later still more dry rot showed itself in some of the roof beams, and at the same time other repairs were made. One which is still visible is the new section to a column at the south-west comer of the church - a difficult operation, and there is no record of how it was done. The old capital was cracked in several places, and the new section is shown clearly by the poor colour match. The raising of the chancel floor, already mentioned, was also done at this time, and the present pulpit installed. During the early years of this century, the links with the Worsley family were gradually severed. The estate had grown considerably, having taken over the Birch Hall estate, and much of it was sold for housing. The head of the family, the grand-daughter of Charles, married in 1907 and went to live in Aylesbury; Platt Hall was taken over by the Corporation of Manchester. 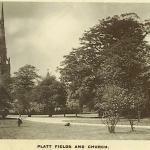 Two attempts were made, in 1901 and 1906 to sell Platt Fields for housing, but through the influence of William Royle, historian and leading citizen of Rusholme, the area was bought by the City Council as a park. The patronage of the church was transferred to the Church Pastoral Aid Society in 1909. In the renovations of 1891 and 1906 it seems that the spire was overlooked. The terra cotta of which it was built was of inferior quality, and Thomas Worsley’s hasty dismissal of Fletcher in 1847 now had its disastrous effect. An examination of the structure in 1910 showed that the flying buttresses were cracked and that the terra cotta blocks in the spire itself were breaking up. The only course was to dismantle and rebuild. Raising the money for this took a long time, and the work was not finished till 1912. Other buildings were added. The church school (now Trinity House) was built in 1861, and the Rectory in 1888. 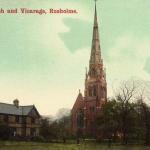 The first Parish Hall on Wilmslow Road was built in 1900 and at the time the design was much admired. But both its site and its interior arrangement proved in time to be less than ideal, and it was demolished, without regrets from anyone, a few months before the new hall was opened in 1967. In 1953 it became obvious that the organ would have to be replaced and after many enquiries it was finally decided to purchase one installed in the home of Dr. Baker the organist at Sheffield Cathedral and used for practice by that Cathedral Choir. Messrs’ Rushworth and Dreaper, organ builders, were employed to transport the instrument to Platt and when renovated and installed it was officially opened at a recital given by Dr. Eric Chadwick in 1954. By 1955 it was realised too that considerable repairs were required to the fabric of the church in consequence of the difficulty of undertaking proper maintenance during World War 11 and the immediate post war years. This was not only a problem at Platt but a national one resulting in the introduction of the new “Inspection of Churches Measure”, whereby all churches were to be regularly inspected by an architect to ensure that maintenance was properly carried out. The first survey under this new measure was undertaken by the Diocesan Architect in 1957 and in 1959 the P.C.C. approved tenders for some quite extensive external repairs, including mastic pointing to the Spire, Tower and sections of the walls of the Nave, Chancel and North and South Aisles subsequently treated with a silicone water repellant. The lightning conductor and holding down chains to the spire were renewed and the upper and lower parapets to the north and south aisles which were bulging were taken down and rebuilt and some lead work to gutters renewed. The roofs to the Chancel, Nave, North and South Aisles, were stripped, wet and dry rot to the timbers rectified and then re-roofed with the old slates which were re-holed and fixed with copper nails on new laths and counter battens with a felt underlay on the existing boarding. This was a pretty dirty job, lasting some twelve weeks, and involved cleaning the church inside every week to avoid any interruption to the Sunday services. This work of course could not be undertaken without money, and the church owed much at that time to the quiet and consistent teaching of the then Rector, John Michie, as he sought to show the privilege and necessity of tithing. To encourage regular giving an “Envelope Scheme” was introduced for those who felt that this might be helpful and interest free loans for five years were made by many members so that all accounts could be paid promptly. The Council did not stop on the completion of these major works but conscientiously and consistently undertook a programme of essential repairs in an agreed order of priority - including clearing of the surface water drainage which was completely blocked, the reconstruction of all paths, the conversion of the existing coke boiler to oil fired and other items. Much of this work was mundane and unseen yet the church members appreciated the need and gave consistently. In 1962 a bookstall was provided in the church by the Youth Group to encourage the reading of Christian literature which they saw as a real help to spiritual growth. Of necessity this account so far has been primarily concerned with buildings, for it is only of these that we have a reasonably complete record. To write a history of the church as a worshipping community is much more difficult, and one can only point out a few features which seem a fair indication that the church has always been both healthy and soundly based in the Evangelical tradition. As noted earlier, the founder of the church was a true Christian, even though his motives were in part open to criticism; and the one short account of the consecration shows the evangelical basis. The second Rector, the Revd. Aubrey Price, is recorded as having held open-air services, and parish missions were held in 1886, 1893, 1912, 1925, 1957 and 1960. The first missionary from the church was Ada Finney, daughter of the Rector of the time, who died in Hong Kong after ten years’ service. For the rest, the minute books give little useful information. There remains just a general impression that while numbers rose and fell a little, and problems appeared and were overcome, the church continued in a fairly healthy state. The two wars brought problems, of course, but the church survived undamaged. In 1964 the end of the period covered by this chapter, congregations were good and the fellowship lively and active.